Glider troops of Germany’s airborne forces landed around Maleme Bridge in Crete in May 1941. They were decimated. The Germans decided never again to mount an airborne assault. The Allies drew the opposite lesson, as a previously unseen American document shows. Maleme Bridge and Hill 107 in Crete, looking east. It was here that the British defence of Crete and the future of the German airborne forces both unravelled. The airfield is forward and left of this shot, which clearly shows how Hill 107 dominated both the airfield and its approaches. German gliders landed in the river bed both to the left and right of this photo. "Stand to! The sun is rising red. To see it rise tomorrow?" For thousands of young German airborne troops who landed in Crete on 20 May 1940, the fatalistic opening lines of their formation song came true. They did not live to see another dawn. Some fell in the sea and drowned. Others fell burning in the holds of their blazing transport planes. Some were shot in their parachute harnesses, or through the flimsy sides of their gliders, as they descended. Some were caught up on olive trees, or injured landing on rough ground, and easily fell prey to their enemies. Many landed among the waiting defenders and in the frantic scramble to get clear of their chutes or gliders were shot point blank. Many, isolated and confused and only lightly armed, were hunted down and killed before they could orient and organise themselves, or find their weapon containers. A Cretan civilian fighter in traditional costume clubbing a German paratrooper to death with what looks like a tree branch. From a plaque on the National Resistance Memorial in Heraklion, Crete. It was not just the British, Australian, New Zealand and Greek soldiers of the island’s garrison who did the killing. Cretan civilians armed themselves with anything to hand and rushed to battle. Old muskets, antique daggers, bread knives, shotguns and agricultural implements in the hands of men, women, and even children, wrought slaughter on the Germans. 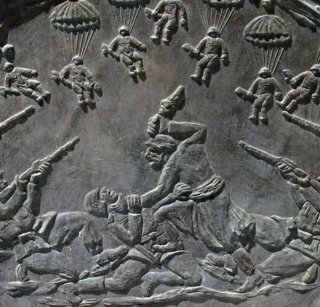 Stories are told of one Cretan who, in his fury, smashed in the helmet and skull of a paratrooper with a rock. “We learned at Crete that gliders have a part to play and can be very effective, especially since they can land a body of men at one point who are organized, equipped and ready to fight. They are not dispersed over a wide area as are parachutists. Some military men attribute the German success in Crete to glider troops who were successful in establishing the initial foothold at the Maleme airdrome. This is why the Troop Carrier Command, to train and equip troop carrier units, and the Airborne Command, to train and equip airborne troops, were created”. The German tactics did not rely on glider troops and paratroopers to capture the island by themselves. Instead, their job was merely to pave the way for air-landing troops who would be repeatedly shuttled in troop carrier aircraft to land on the runways of airfields seized by the paratroopers. The Germans had several hundred Junkers 52 (Ju52) transport planes. Despite this apparent superfluity, the German plans for Crete sought to protect them as much as possible. If the planes were lost in the first waves, they would not be available for subsequent waves, and it was the subsequent waves of air-landing troops who would build up the sheer weight of forces that would allow the Germans to outweigh the defenders’ superiority in numbers. To this end the gliders were launched from way offshore to protect the transport planes that towed them (exactly as the Allies later chose to do in Operation Ladbroke). It was also to this end that the primary target of the glider troops was the Bofors 40mm AA guns defending Maleme airfield. Left intact, these might otherwise wreak havoc on the following waves of transport planes carrying paratroopers. The glider men could then provide covering fire for the descending paras, and help them capture the airfield. 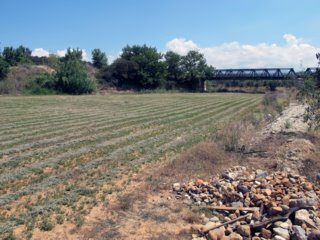 The eastern span of Maleme bridge seen from the river bed of the Tavronitis, which is dry in summer. The river bed is flat and wide. On the left can be seen the banks of the river which provided some cover for the glider troops. The top of Hill 107 is just visible on the left in the far distance. So the role of the gliders was to spearhead the entire assault. The glider men were the heroes of the assault on Eben-Emael in 1940, and were seen as the elite of the airborne division’s Assault Regiment, itself the elite regiment of the elite airborne forces. Theirs seemed the most dangerous and crucial role. The gliders landed in the dry, wide bed of the Tavronitis river next to Maleme airfield because it was close to their targets and afforded some cover from the defenders on nearby Hill 107. It also allowed them to seize the bridge and hold it for parachute (and, later, seaborne) forces landing further west, away from the airfield defences. Photographs show at least one glider with its nose on the ramp at the start of the bridge (perhaps the inspiration for the ‘Illustrated London News’ painting showing an Operation Ladbroke glider on the ramp of the Ponte Grande) . 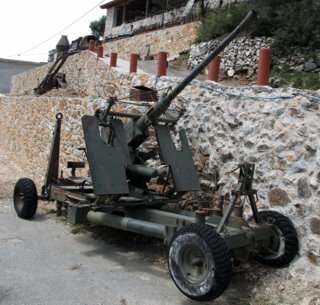 An Italian 75/18 model 34 mountain gun guards the National Resistance Memorial in Heraklion, Crete. 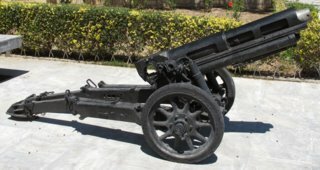 The British and Commonwealth forces had several of these captured weapons, but without gunsights. They nevertheless helped cause havoc among Ju52s landing at Maleme, but not enough to make a difference. What happened next is well known. The New Zealand soldiers holding Maleme fought doggedly and held out all day, convinced they were winning. Their German enemies also feared they had lost, and awaited with trepidation the inevitable counterattack that would crush them. But, in one of the most extraordinarily tantalising what-ifs of the war, the local NZ commander inexplicably pulled his men off Hill 107 and withdrew, and no counterattack was launched until it was too late. The Germans began landing Ju52s loaded with troops on Maleme airfield. They came under fire from field guns and nearby New Zealanders, and many planes were destroyed, but the damage was done. 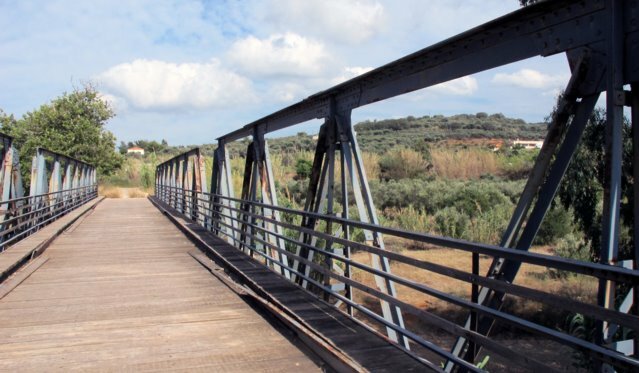 There on the banks of the Tavronitis river the defeat of the British, Commonwealth and Greek forces in Crete became inevitable. “Parachute and glider troops are vulnerable if they come in low near ground defenders, and should not be landed on top of their objectives. “Gliders are more difficult to destroy in the air than transport planes, and can land with safety to occupants in places where transport planes would crash and burst into flame. The author of the lecture talked not just about using airborne forces in rear flank attacks, but also in wholesale airborne invasions. By “invasion” he meant attack and occupation using troops delivered by air alone, as had happened in Crete. He said this was an imminent reality, but clarified that he was talking about the Pacific islands and the war against Japan. The terrible events in Crete may have put off the Germans, but they had quite the opposite effect on their enemies. The lessons of Maleme made the Allies even more gung-ho about gliders and massed airborne assaults. This entry was posted in All Posts, Archive Documents, Battlefield Visits, Gliders in WW2 and tagged Battle of Crete, Eben Emael, German gliders, Italian artillery, Kurt Student, Maleme, Operation Ladbroke Sicily 1943, TCC (Troop Carrier Command). Bookmark the permalink. An excellent account Ian that highlights some of the key points of this unique WW2 battle. Battle damage & losses of the J52 fleet were a real problem that was not foreseen by the planers of Op Mercury. Refueling by hand & the dusty runways were another unforeseen delay in getting the next wave of aircraft off the ground. Thanks for the originality of your photos about river TAVRONITIS ,bridge and the famous HILL 107 . The initiative to take this position was the idea of an medical officer fallschirmjager . Your mind make the difference and in the morning of the second day, one Juncker52 arrived with fresh troops gerbirgers and airborne. The cadence of this arrives was fantastic : one plane each 2 minutes . The aura of invencibility in the German Airborne Corps was a reality . Victories and experience since 1939 determined the strong reputation of the german green devils . In my humble and modest military opinion : the fallshirmjägers was the best special troops of WWII . For reconnaissance warfare and raids behind ennemy lines the Long Range Desert Group and the S.A.S. For jungle warfare the chindits of Orde Wingate. For special naval warfare ,the italians X flottiglia MAS of Junio Valero Borghese .